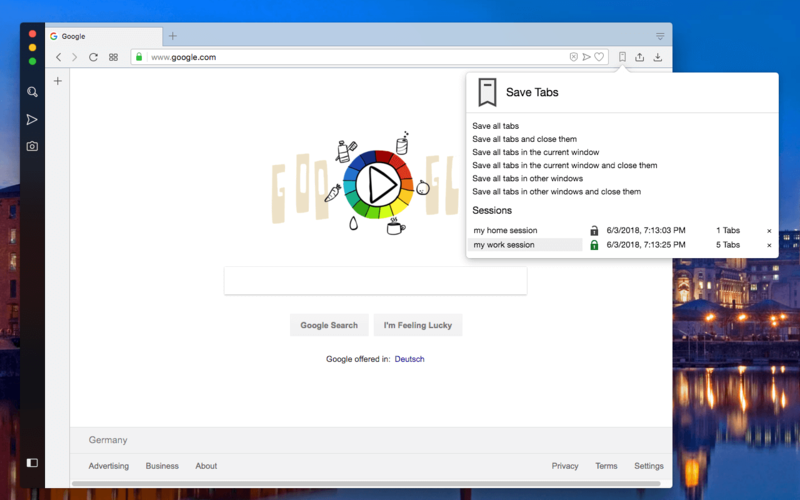 "Save Tabs" has multiple options to save tabs in the current window, other windows (all windows except the active one) or all windows all together to restore them later. This can be used to release high-memory usage of your browser or to revisit the current tabs later. The extension keeps the tab positioning, active state and whether the tab was pinned or not. Also, it uses the browser's sync capability to restore tabs later on another device which is synced with this device. You can optionally protect your session data with a password to secure the session or to prevent any unauthorized access to the session data. If a password is specified while a session is created, there is no way to restore the session unless the correct password is provided. As a plus point, this extension uses a non-persistent background script to make sure it has no effect on the browser performance when the extension is not being used. What is the "Save Tabs" extension and how does it work? This extension is meant to declutter your browser by removing all the tabs and saving them for later use. It can also be used to free up the memory usage of the opened tabs. To store tabs, use the popup window and select what type of tabs you would like the extension to save. You can either ask the extension to save the current window or all other windows except the current one or all windows altogether. Also, there are three options to ask the extension to close the saved tabs when the session is created. This extension is capable of saving protected sessions as well. When you request a session creation, a dialog window is shown in the popup. In this popup, you can define a name for the current session which is mandatory. Also, you can protect the session with a password. Note that if a session is password protected, there would be absolutely no way to recover the session without having the password. So make sure to remember the password or add a hint to the name of the session to help you remember the password. To restore a session, use the popup. There is a sessions section that has information about all the saved sessions. You can see the number of tabs in each session, whether the session is password protected or not, and the time when this session is created. Click on the session name to restore it. Note that when the session is clicked, all the tabs and windows in the session are going to be restored while the tab ordering and their pinned status are kept intact. So if you had like three open windows, you will get new three windows when the session is restored on a desktop browser. When a session is fully restored, its data is erased from the extension's storage. If you need to keep the session for later use, use the Shift key while clicking on the session name. This will prevent the extension from erasing the session data when it is fully restored. How does this extension protect a session data? Is it really safe considering the extension storage can be read easily from the browser console? Absolutely safe. The extension uses SHA-256 public and private keys to encrypt and decrypt your session data so basically without having the password, there is literally no way to recover the session data. Can I use this extension to save tabs in one browser and recover them in another browser? This extension uses synced storage of your browser so if you sync two or more devices then your tab data is shared between these devices. To prevent unauthorized access to your session data, make sure to protect the session with a password. You can have as many passwords as you would like. Just add a hint to the session name to make sure you can remember the password later. If I save tabs from multiple windows, the extension restores all windows when I restore a session. Is there a way to have all the tabs in a single window instead? Use the Ctrl (or Command) key while restoring a session to force the extension to restore into the current window. You can combine this key with the Shift key to force restoring to the current window while keeping the session for later use.